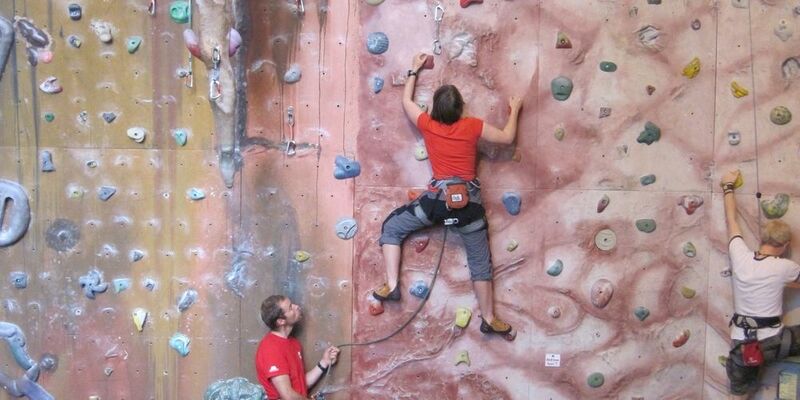 The Climbing Wall Award trains and assesses candidates in the skills required to supervise climbers on purpose built artificial climbing walls and boulders. It is ideal for people who work at climbing walls or at venues with permanent or mobile climbing towers. There is also an optional Abseil Module (often run in conjunction with the Climbing Wall Award) which is all about supervising abseiling in climbing walls. The climbing wall award is a supervisory award aimed at those who are keen to take a position of responsibility in the climbing environment. The course ensures good practice, leading to the safe enjoyment of climbing activities along with gaining a sound understanding of climbing. Course consists of two days training covering both personal and group climbing skills as per the Climbing Wall Award Syllabus. This occurs at two separate climbing wall sites. The course aims to address the technical skills and judgement required to safely supervise and coach people in an indoor or artificial environment. This training course gives you the confidence and the skills to get out and practise before assessment after the consolidation period. The assessment course covers both personal and group climbing skills as per the Climbing Wall Award Syllabus. The course will assess the candiates technical skills and judgment required to safely supervise and coach people in an indoor or artificial environment. Candidates should be familiar with all aspects of the syllabus before assessment, even if some parts were not covered during training. Assessment courses provide at least six hours of contact time between candidates and assessors and candidates are tested in accordance with the syllabus.